On Saturday and Sunday 13-14th April, GB4DFI will be on the air from the Cray Valley shack to commemorate Owen's life and his strong connection to the Club. Owen kindly donated all his gear including two transceivers to CVRS, and they will be in use throughout the weekend. The FT1000MP Mark V will mainly be on 40m, and the IC7400 mainly on 20m. Operation will start at around 8am Saturday and continue until just after 9pm. Operation will resume on Sunday at 8am and continue until 5pm when GB4DFI will go QRT. As is appropriate, QSLs will be available but please see the qrz.com entry for full details of the new QSL policy. There will be a display of Owen's life and times in Cray Valley, including a montage of the many callsigns for which he handled the QSL duties. Members and non-members who knew Owen are especially welcome to pop in at any time when the station is on the air. I was shocked when I heard Owen had passed away from a heart attack during the early hours of 29 November. He had been suffering from breathing problems for a while, and had been admitted to hospital a few days earlier. He rang me from his hospital bed. As he had missed a couple of meetings, he asked for an update on the meetings and the training course. He was due to have more tests and chest x-rays the next day. I never heard from him again. I had known Owen since our SWL days in the 1970’s. He was a very good SWL (BRS33364) and used to contribute to my ‘SWL News’ column in Radcom. He joined the Society in 1971 and was elected to the committee in 1973/74. In 1974 he passed the RAE and was licensed as G8HYH. Soon after, he passed his Morse test and became G4DFI. Owen took on the Treasurer’s role in 1974/75, and in 1976 became Membership Secretary due to membership numbers approaching the 140 mark. Owen made it his job to welcome new members to the Society, something he was still doing 40 years later. Owen was Chairman in 1981/82 and for a short time in 1986 when pressure of work and domestic reasons led to the Chairman at the time standing down, before being elected as Vice Chairman for 1986/87. During the early years of his membership he was an ever-present at the special event stations organised at the Danson Show, the Bexley Show and the Plumstead Make Merry in the 80’s. He had also operated at most of the special event stations organised by the Society over many years. He was ‘the fox’ at several DF Hunts in the ‘90s and ’00s. In 1995, when the Society was going through a rocky patch, he joined a sub-committee to look in depth at the status and future of the Society. Owen’s enduring work on behalf of the Society was recognised in 1988 when he was elected as a Vice-President and in 1990 when he received ‘The Founder’s Cup’. Even in recent years when his health was deteriorating, he was an ever present at meetings and fully supportive of the Society and its activities. Owen also enjoyed contesting, taking part in the major HF SSB contests (CQWW, CQWPX, ARRL DX) and some of the smaller ones (Helvetia, UBA, PACC, etc). He was proud to have received many first place certificates. He also supported Society contest activities, submitting logs for the 2m UKACs, 2m AFS, 80m AFS, etc. He worked 225 DXCC entities but never applied for DXCC. However, Owen was seriously into VHF DXing in the 70s and ‘80s and often reminded me of the DX he had worked in 2m tropo and Sporadic-E openings. Owen was one of only a handful of members who qualified for the Gold Award for working 100 Cray Valley members. But perhaps Owen’s main claim to fame was as our QSL Manager. I’m not sure how long he had done the job. Records show he was QSL Manager for M2000A in 2000, but he had acted as QSL Manager for our special event stations well before then. He responded to thousands of QSL requests; the boxes of QSL cards in his garage are proof of his dedication to grow the name of Cray Valley Radio Society around the world. As a result his callsign is synonymous with the great QSL Managers around the world. 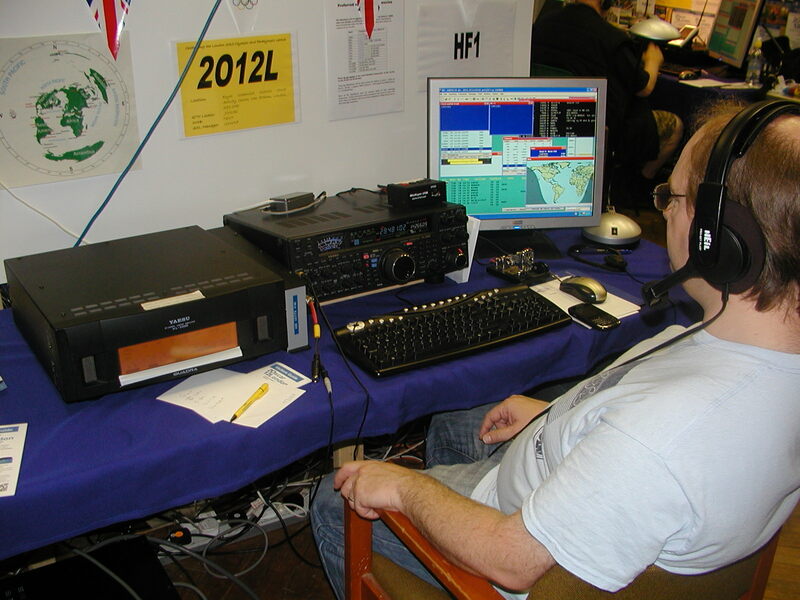 Since 2000, Owen had acted as QSL Manager for 29 special event stations organised by the Society, as well as a number of Nobby G0VJG’s DXpeditions. Owen was truly a stalwart of Society activities from the day he joined right up to his untimely passing. On behalf of the Society, thank you for everything you did for us. You will be sorely missed. Welcome to the web site of the Cray Valley Radio Society. We are situated on the SE London/NW Kent border. We hope that this site will be able to provide all the information you require about the Society and its events throughout the year! If you're a new visitor to this site and you want to know more about Amateur Radio, please scroll down to the next section of this page. Starting with M2000A to mark the Millennium, Cray Valley has mounted a number of high-profile special event stations culminating in 2012L for the London Olympics. Since then we have re-focused on smaller events such as GB6MW for National Mills on the Air weekend, and GB2CM at Crossness Pumping Station. The Society runs licence training courses each year, with an annual Foundation course and alternating Intermediate and Full courses. We also co-ordinate training dates with other active clubs in Kent and south-east London. Having secured planning permission from the Royal Borough of Greenwich, our HQ in Eltham has been equipped with a Tennamast 12m telescopic mast supporting a Cuschcraft A3S beam for HF, a 9-element yagi for 2m, and wire antennas for 80/40/17m. The station is open each week for any member who wants to operate, by arrangement with the Shack Manager Trevor, M1TAD. Membership levels have broken through the 100 barrier, and a good proportion of the membership attends our regular meetings which take place in Eltham on the first and third Thursdays of the month. Members receive a monthly newletter which contains news from the Society; a copy of a past issue can be accessed via this link . We run an award programme for contacting members of our club, click this linke for information on the Cray Valley Award and how to claim it. Amateur radio operators ('radio hams') are able to make short-wave radio contact with fellow enthusiasts all around the world. Unlike Citizens Band, which was introduced in the 1980s and intended to provide short-range personal communication, radio hams use their knowledge of short-wave propagation and antennas to make contacts around the world, often using no more radio power than 100 watts – the same as a domestic light bulb. There are many facets to the hobby of amateur radio. Some people use it to keep in regular contact with friends or family living far from home. Some spend most of their time on the air contacting as many countries as possible and communicating with many exotic locations world-wide: there are over 330 different countries to be contacted. Others concentrate on designing or constructing equipment or antennas, while some get involved with emergency communications following disasters, such as hurricanes or floods. Through their hobby, most radio hams gain an insight into the people and cultures of other countries, and for young hams it can open up a path into a career in electronics or communications. Interested?... thinking of becoming a radio ham? World-wide to become a radio ham a level of proficiency needs to be demonstrated (by examination) to gain a transmitting licence. In the UK the amateur radio licence is structured in three levels that need to be passed in succession - foundation, intermediate and finally the full licence - each level offering more operating privileges. It is down to personal choice how quickly individuals progress through the licence levels towards the full licence. The foundation licence gives a good grounding in safe responsible operating at low transmit power - enough to make world-wide contacts using most of the amateur bands, and gives new starters a good appreciation of the hobby with minimal investment of their time to get their first licence. The intermediate licence gives more privileges and finally the full licence with all UK operating privileges including the ability to operate outside of the UK e.g. while on holiday (or aboard a vessel at sea) subject to local regulations and the country visited. We had great success with our recent Foundation course with ten candidates passing. Our next Foundation course will take place in February 2020 and registration will open in mid-2019. Candidates wanting to get licensed before then should look on the Training page where full details are given of courses in south-east London and west Kent. We have added sweatshirts and caps to the CVRS clothing range. At the same time we have been able to lower the prices. The prices are for collection at a club meeting. Please transfer the amount to the club's account (as printed at the bottom of each QUA) alongside your order. If you are unable to collect the items at a club meeting, the cost of shipping to UK addresses starts from £2.30 for a cap, and £3.95 for the other items. The cost for larger orders or overseas shipping will be calculated upon request.